Alright, who's ready for a contest? To celebrate my 9 year blog-o-versary I'm holding a contest. Remember how I told you that the rest of my posts in June would would be related to the number 9? To enter I need you to do a post with 9 cards and provide the link to your post in the comments section below. It can be any 9 cards. It can be your 9 most valuable cards. 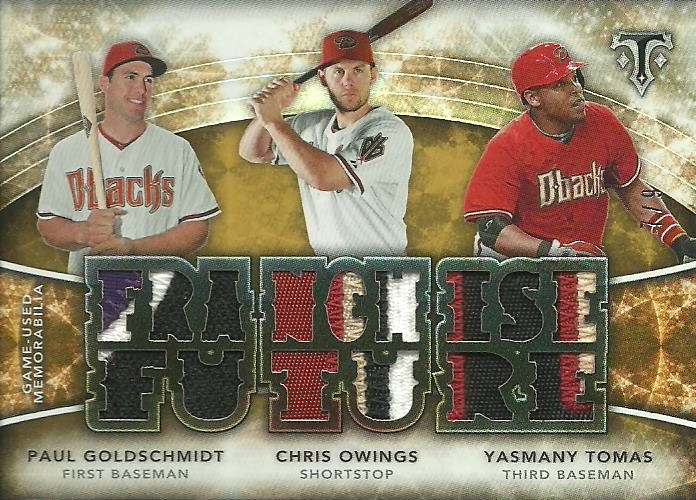 9 cards from your favorite team. 9 cards that you want to trade. 9 cards you hate. Any 9 cards. I'm going to go with 9 cards of my favorite player. 1. Let's start with a rookie card. 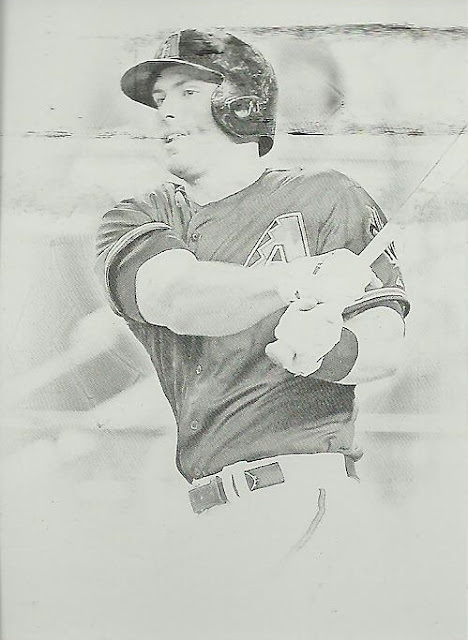 Not just any rookie card. 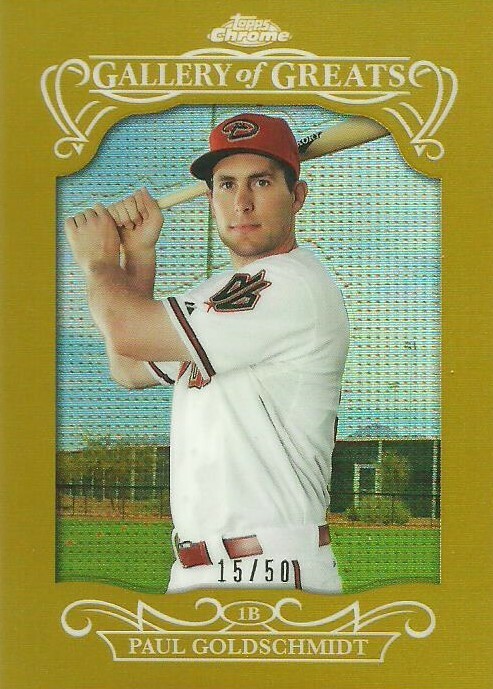 It's his 2011 Topps Update Rookie gold parallel numbered out of 2011. 2. 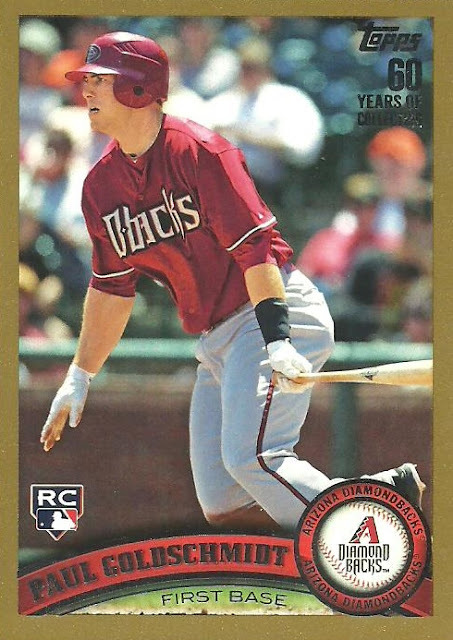 Speaking of gold parallels. I love gold parallels of Goldy and this Topps Chrome Gallery of Greats parallel numbered to 50 is a sweet looking card. 3. I have several versions of this card, but this is my favorite. Not only does it feature a great looking patch and numbered to 10, but I got it for under $10. 4. I've got 6 different Five Star Goldschmidt autographed cards, but this base card numbered to 75 is far more rare than any of them. 5. 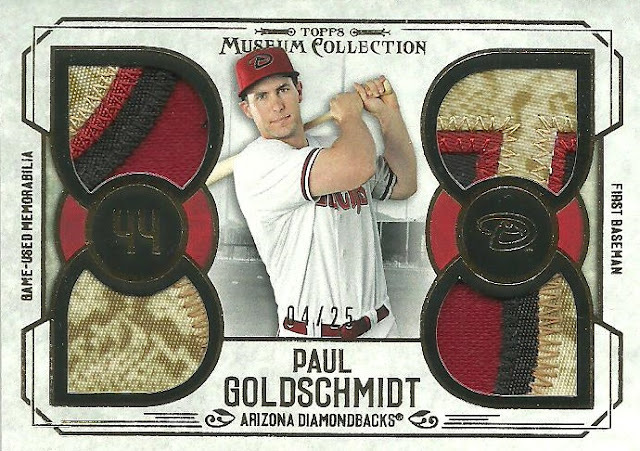 Check out the patches on this Museum Collection Quad Relic! 6. 2015 Topps Tribute Black Printing Plate. In addition to this one, I also have the magenta and yellow version. I just need the cyan and I could print my own cards. 7. 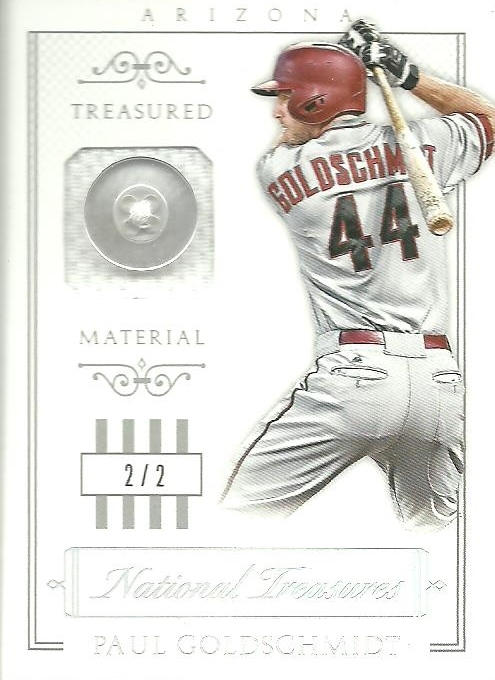 Nothing lost with this unlicensed National Treasures button card numbered to 2. 8. 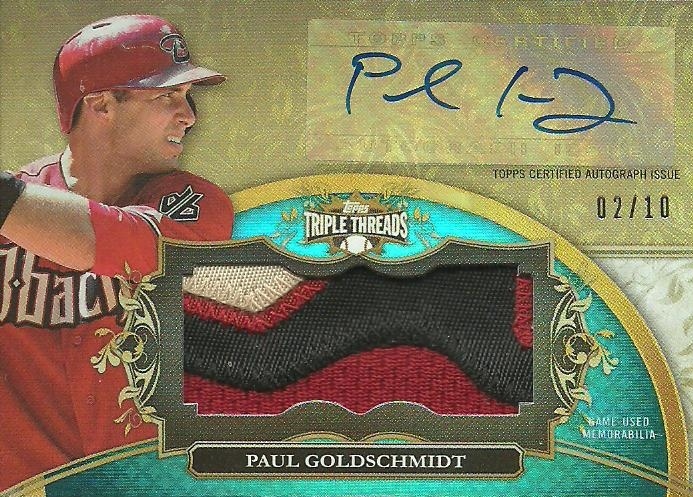 Love the patches on this Triple Threads relic! 9. My most recent addition. 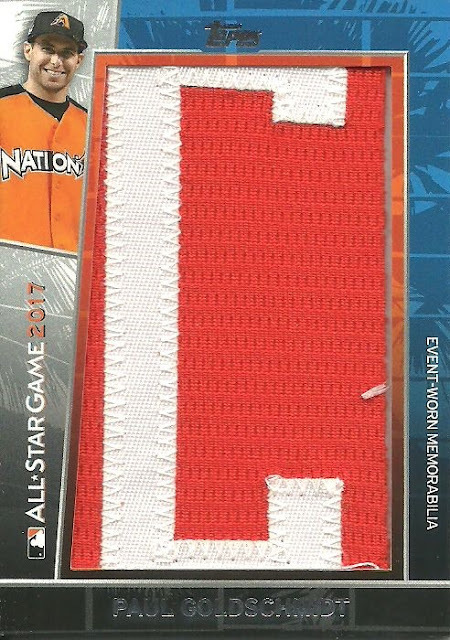 A 2018 Topps In the Name 2017 All-Star event-worn relic. I'll leave the contest open for a full week and choose a winner on Sunday, July 1st. The winner will receive a nice little package of Goldschmidt cards from me and at least one card for you PC. Here's mine Congrats again and thanks for the contest! Cool idea, and I love your countdown. Here's mine. Dang. Sweet Goldschmidt collection. Those Museum patches are awesome! Thanks for the contest and happy 9th! Thanks for giving me something to write about! 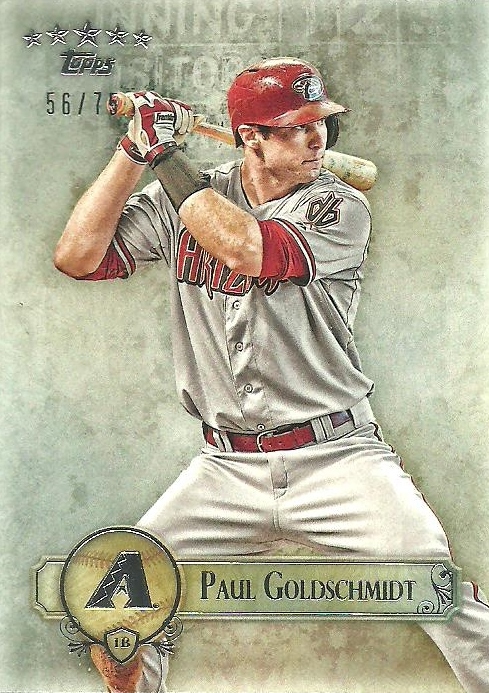 Awesome Goldy cards. I will work on mine today and post tomorrow. Posted. I had fun with it. Going to do another 9 tomorrow. Heres my post. Again congrats! That all star patch is sweet! 9 years is a lot! congrats! I actually saw PG play in college. His time at Texas State overlapped my son's time there. Needless to say he's the biggest sports star the school has ever produced. Thanks so much for the contest. Snuck my post in under the wire. Thank you for the contest, and congrats again on 9 years! When Twitter and the Blog-o-sphere collide.